These young ladies were recognized as Pennsylvania Angus royalty at the 2010 Pennsylvania Angus Association Annual Meeting and Banquet, January 10 in Grantville, Pa. Seated from the left includes Kate Livingston, Dover, princess; Katrina Frey, Quarryville, 2009 queen; Hannah Grim, East Berlin, 2010 queen; and Lindsay Upperman, Chambersburg, princess. Sweethearts standing from left include Shelby Dean, New Castle; Rachel McKean, Mercer; and Amanda Cole, Bentleyville. Hannah Grim, East Berlin, was crowned the Pennsylvania Angus queen at the 2010 Pennsylvania Angus Association Annual Meeting and Banquet, January 10 in Grantville, Pa. 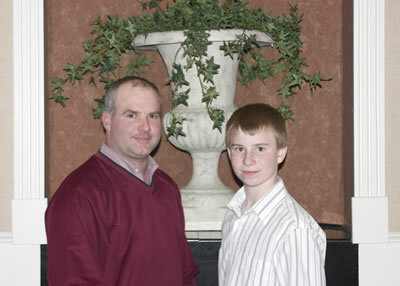 The Pennsylvania Junior Angus Association presented Kyle Livingston, Dover, right, with the 2009 outstanding boy award at the 2010 Pennsylvania Angus Association Annual Meeting and Banquet, January 10 in Grantville, Pa. Pictured presenting the award is Fritz Frey, Pennsylvania Junior Angus Association advisor. 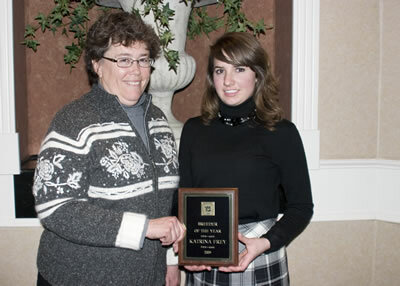 Katrina Frey, Quarryville, right, was named the 2009 Pennsylvania Angus Association's breeder of the year at the 2010 Pennsylvania Angus Association Annual Meeting and Banquet, January 10 in Grantville, Pa. Presenting the award is Cheryl Fairbairn. 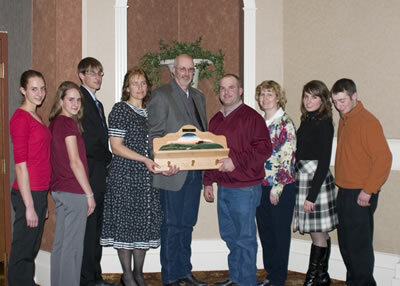 The Trowbridge family was named the 2009 Pennsylvania Angus Association's family of the year at the 2010 Pennsylvania Angus Association Annual Meeting and Banquet, January 10 in Grantville, Pa. Pictured from left includes Maria Trowbridge, Elizabeth Trowbridge, Eugene Trowbridge III, Valerie Trowbridge and Eugene Trowbridge II; and presenting the award Fritz Frey, Nancy Frey, Katrina Frey and Fred Frey, 2008 family of the year. 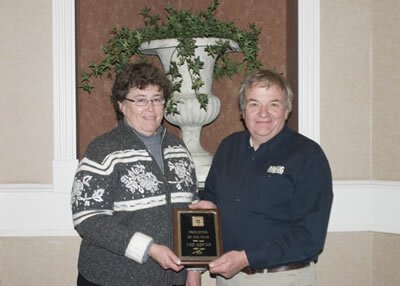 Ned Hower, Bethlehem, right, was named 2009 Pennsylvania Angus Association's promoter of the year at the 2010 Pennsylvania Angus Association Annual Meeting and Banquet, January 10 in Grantville, Pa. Presenting the award is Cheryl Fairbairn. 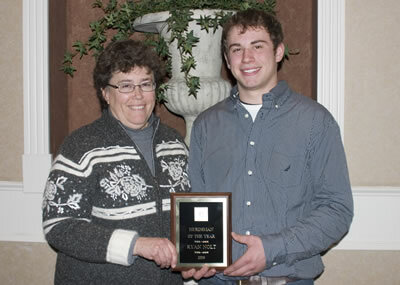 Ryan Nolt, New Holland, right, was named the 2009 Pennsylvania Angus Association's herdsman of the year at the 2010 Pennsylvania Angus Association Annual Meeting and Banquet, January 10 in Grantville, Pa. Presenting the award is Cheryl Fairbairn. 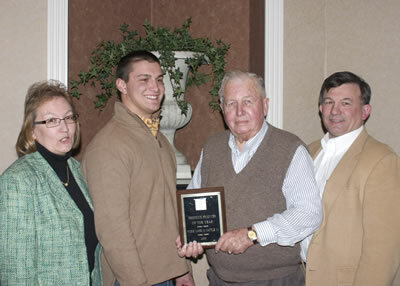 Work Land and Cattle Company, Uniontown, was named 2009 Pennsylvania Angus Association's seedstock producer of the year at the 2010 Pennsylvania Angus Association Annual Meeting and Banquet, January 10 in Grantville, Pa. Pictured from left includes Linda Rooker, Billy, Jim and Bill Work. Hannah Grim, East Berlin, right, has earned the National Junior Angus Association's Bronze and Silver Awards at the 2010 Pennsylvania Angus Association Annual Meeting and Banquet, January 10 in Grantville, Pa. They are the first two levels of the National Junior Angus Association Recognition Program. Pictured presenting the award is David Mullins, regional manager of the American Angus Association.